Students at the Nkwusm Salish Immersion School in Arlee concentrate last week during language lessons. The school, founded by four non-Salish speakers to keep the language alive, is 10 years old this fall. 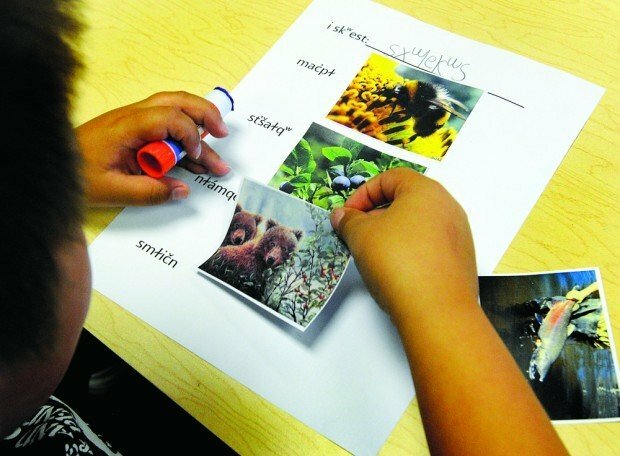 A student works to match photographs with Salish words during a class exercise. ARLEE – It was time for lunch last week on the third day of classes at Nkwusm Salish Immersion School, and Pat Pierre was getting young again. The Salish elder and Nkwusm language specialist had just put 13 children grades kindergarten through fourth through their vocabulary paces. For each English word, with an occasional lighthearted prompt from teacher Adele Martin, at least a few of the students had offered excited replies in Salish. They’d twisted and squirmed in their small chairs around the table. Two had peered through rings around their eyes made by thumbs and forefingers. Another had leaned sideways in his chair, one leg elevated a leg nearly to shoulder level. But each had listened intently for the next cue, and now all of them were crowding Pierre like teens around a rock star. One by one they reached up to give their 83-year-old mentor a loving hug. For each embrace Pierre responded with a Salish term of endearment. “I just want to stay here,” one child said wistfully in English. Pierre looked up after the last student left the room. “That’s what makes the day good,” he said with a grin. “I’ve been here for 3 1/2 years and they’ve been doing that with him all that time,” said Gene Beaverhead, who sat watching across the room. Each of three classrooms at Nkwusm has a teacher, an aide and a designated language specialist. Beaverhead is one of the latter, along with Pierre and Stephen Smallsalmon. They’re among fewer than 50 people in the world deemed fluent in the Salish language. This was Beaverhead’s class, but he sits back and observes with obvious respect and admiration when Pierre takes time during his breaks to come in. Nkwusm turns 10 years old this fall and change is in the air. The school in the former bowling alley north of Arlee hired its first principal this year, and it’s setting up a system of tests that for the first time will establish a baseline for each student and a gauge for his or her growth. But its focus remains much the same. “The main purpose of the school is to bring the identity back to our people through our children, whereas at one time it was the other way around – the parents taught the children the language,” Pierre said. The private school has expanded from half a dozen preschoolers in 2002 to a curriculum for kids age 2 1/2 through eighth grade. Enrollment this year was 24 on the first day, and up to a dozen more students are expected when the dust settles after Labor Day. Kasie Murphy-Brazill, the new principal, grew up on the Flathead Reservation, owns masters degrees in social work and education leadership, and is working on her doctorate. “The (Salish) language is of vital importance, but we want to increase academic performance for kids as well, so they’re able to walk in both worlds and do it really well,” she said. Doug Morigeau calls it a new beginning at Nkwusm. “We’ve got lots to talk about, lots that we’re doing, and lots that we’re considering,” said Morigeau, a former long-time administrator at Salish Kootenai College who was hired this summer as the school’s outreach director and lead fundraiser. Not all agree that drastic change is needed. Pierre pointed out that classroom teachers at Nkwusm are Montana certified. You’ll also witness plenty of evidence of what Nkwusm was created for in 2002, by four young men and women who weren’t fluent in the Salish language but saw an urgent need to save it. The preschool kids, including Murphy-Brazill’s 3-year-old granddaughter, spend the morning fully immersed in Salish and the afternoon exposed to it. Bell and Melanie Sandoval are the remaining co-founders at Nkwusm, and they’re determined to see it reach its potential. “We have a saying,” said Bell, who then said it in Salish language. “We’ll never give up,” he translated for himself. It’s even more urgent in 2012, because all but two of the fluent speakers of Salish are 70 or older. 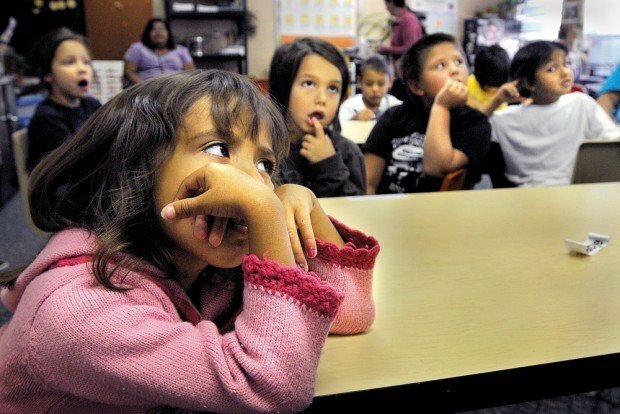 Children here and from across the reservation are becoming fluent, but there’s a gap in the middle of a generation or more. “The next five years are pretty critical in my opinion,” said Bell, who’s just 35. “We really need to produce fluent speaker that have the opportunity to be around first language speakers like Pat and Stephen so that they pick up that old dialect, and so we don’t change the language too much. Sandoval said the founders “tried to do everything” when the school first opened, cleaning the floors and answering phones even as they taught, sought donations and grants and developed educational programs. As the school grew, so did the chores. It got to a point, she said, where they had to decide whether they were school administrators or purveyors of the language. Enter Murphy-Brazill, a certified principal who fills the role school directors formerly occupied. Last year Nkwusm added adult language lessons, teaching what they hope will soon be teachers in the near future. It’s based on an intensive and sequential program built by Chris Parkin. The former high school Spanish teacher in Spokane quit his day job to help his wife, LaRae Wiley, develop a curriculum designed to help save her Kalispel-Pend d’Oreille language, which is similar to Salish. Sandoval and Bell, along with Pierre and Smallsalmon, have “localized” the program and now work with four adult “apprentices.” The co-founders are earnest in their studies, but neither is fluent in Salish yet, even though Sandoval has been working at it for 20 years and Bell the past 10. “It was just too slow of a process,” added Sandoval. With Parkin’s program and a three-year federal grant in place, they’re making up for lost time. But there’s no time to lose. Much more than words imbedded into the Salish language. HELENA – Sen. Jonathan Windy Boy treated fellow state senators Wednesday to something they rarely hear: A greeting in his native Cree tongue.